This book provides an explanation of key underlying economic principles, allowing the reader to come to a better understanding of the critical factors that structure and guide transport markets. This is done through an examination of the interaction between the behaviour of individual users and providers of transport services and transport authorities actions through the implementation of transport policy. 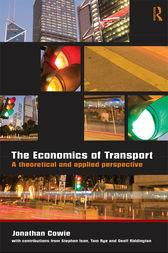 The book also considers on-going reforms in the organisation of all aspects of transport provision. These reforms seek to move transport delivery away from a model of high state intervention towards one that is far more market focused in its approach, thereby significantly increasing individuals’ responsibilities for their own transport actions. With a selection of case studies and exercises, this book will be of use to higher level students. It will also be of interest to professionals in the transport planning, transport modelling and transport economics fields. Jonathan Cowie is a lecturer in transport economics in the School of Engineering and the Built Environment at Napier University in Edinburgh.